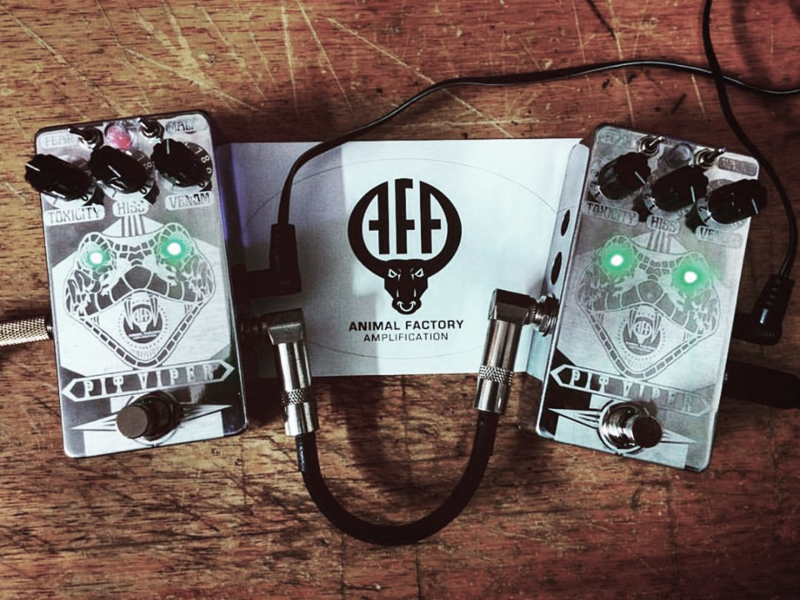 In conversation with the dark horse behind Animal Factory Amplification, the Mumbai based company that build one of a kind guitar pedals and amps, with their latest and most exciting venture for all electronic musicians and synth enthusiasts alike. The company boasts of being the first Indian export in the synthesiser domain with their Animal Factory Amplification modular desktop synth as well as a more portable monophonic synthesizer. His gear has been used by heavyweights such as David Torn, Alan Moulder, Annie Clark, and Trent Reznor. Aditya Nandwana also creates dark, pulsating, industrial Techno under his moniker Sawhorse, with his set up varying from a hundred percent hardware rig, to another, where he uses Ableton to sequence and trigger different sections of his tracks. The rare and rather elusive lone wolf takes us through his influences, background, sonic preferences and current endeavours through an exhaustive run through of his forthcoming synthesizers, live sets, and manic influences. Read on to find out more. I’m really proud to announce a miniature desktop modular syntheziser that I first unveiled at the Under25 Summit in Bangalore in January. It has a complete feature set that a basic syntheziser should have, and a bunch of unlikely tricks up its sleeve too. 100% analog and uses jumper points instead of 1/8” sockets to make it a whole lot more affordable than it would be otherwise. Tell me a little bit about your background and how you got into building pedals and other outboard equipment? I’m an engineer by education, but building sound circuits (specifically, pedals) happened well before that – it was some time around 1999, before university studies, that I built my first circuit (with the help of a friend). It was an Aron Nelson Hornet Fuzz, and lived for all of a few seconds before it died, likely due to a loose connection or bad soldering. That kind of set something in motion though. Over the next few years I started building more simple effects and learning about electronics along the way. I have to thank Warren Mendonsa at this point – he commissioned the first ever pedal I built for somebody else, a clone of the Butler Tube Driver. It sounded horrendous and probably got trashed. Warren, if you’re reading this, I still owe you a Tube Driver. Around 2008-9, the itch had grown into an urge, the urge into an addiction. If you want to fuel your addiction, you’d better have some disposable income – hence, I figured I should start taking on some of the custom build enquiries I was getting at the time and make my habit pay for itself. I did a few pedals and a couple of tube amplifiers as custom jobs for people, as well as a few mods and repairs. At some point I got a bit fed up and I figured that I didn’t want to be known as a custom shop/cloner and would rather take on a product focus. I think that was really the birth of AFA as an idea. For 2017, I’m expanding the AFA product offering by adding synth modules and standalone desktop synths. A driving factor behind AFA was to make people think about sound, music and hardware differently – I feel the synthesizer is perfect, always incomplete, always evolving. Was there a particular moment that you decided you’d dive in headfirst? I don’t think so – it hasn’t been a smooth path, but if I’d have to pick a particular moment that made me think about doing this commercially, it would be this one: A friend came over to check out my work for the first time. He picked up this Big Muff clone I had in my collection that I’d hand etched with a huge pi symbol and said “I don’t know what this does, I don’t know what it sounds like, but just by looking at it I know I want it. I need you to give me a price right now!” That’s when I figured that I might have something going – and also just how big a role the individuality and aesthetics would play, if I wanted to build up a brand. What are your primary motivations or inspirations behind what you do? The sound. I’d dreamed of being a musician when I was a kid, but along the way I’ve come to realize that the creation and shaping of sounds, along with the machines that do it, fascinates me far more than musicianship will. We lacked a sense of sonic individuality growing up in Bombay – there was a distinct lack of access to anything but the most vanilla musical gear, and everything was ridiculously overpriced as well. Perhaps this is my way of compensating for that. Are there any new projects that you’re currently working on that you’d like to share with us? There are a whole bunch of new projects in the pipeline but I’m only going to share a couple of them – firstly, I’m really proud to announce a miniature desktop modular synthesizer that I first unveiled at the Under25 Summit in Bangalore in January. It has a complete feature set that a basic synthesizer should have, and a bunch of unlikely tricks up its sleeve too. 100% analog and uses jumper points instead of 1/8” sockets to make it a whole lot more affordable than it would be otherwise. This also makes it a lot more expandable. Secondly, some of the stuff I’ve already built and sold will soon be available in a synth-friendly format. There are some more projects I have in the pipeline – both for guitar and synth – that I am not going to elaborate on now. I am excited to venture out of the distortion/fuzz/drive space though. Could you describe the tonality that you’re looking for with your equipment? It’s hard to generalise, but I’ll say that the general aesthetic I look for is a bit of roughness around the edges. For want of a better descriptive, I’d say I look for some amount of grain, be it analog or digital. A further design principle is to make the effects usable for other instruments; consequently, I try to cut as little bass as possible – even on guitar-oriented pedals like the Pit Viper, the low-end roll off is only at the initial stage. I like broad-bandwidth sounds, I’m not too crazy about making the live instrument sound like a recorded one. I do use a lot of distortion liberally and love feedback and fuzzes that do weird things, but I don’t like to leave things to chance either. The elements of sonic control and usability are important to me and flow into the process. Lastly, character and individuality. I’m not looking to be “the XYZ of India” or make “the Indian Tube Screamer/Big Muff”. If I don’t think an effect has enough going for itself to stand out, I don’t want to do it. You also produce music under the alias Sawhorse, tell us a little about your sounds and your live set up? Oh Sawhorse. The demented delinquent alien love child of random conversations with Bhanuj Kappal and Rana Ghose. I think we first spoke around December 2015; I was at a REProduce Artists event in Colaba, Bombay, where Jessop & Co. were destroying eardrums and bourgeois future-bass sensibilities with an unhinged noise set. I felt rather inspired by the whole spectacle and quipped to Bhanuj that I’d always wanted to do something of the sort. Two weeks later, despite my best efforts to avoid it, Bhanuj and Rana had convinced me to perform my first ever gig (billed as Animal Factory) at a repurposed bakery (which was packed with people I knew and didn’t know). Sweating bullets, I made it through an hour and was pretty surprised when people told me they loved it. Special thanks and big love to Reji, Sanaya, Ayan, Himanshu and Abhi Meer for their support and encouragement after that. I really don’t know how to describe the Sawhorse sound, though. I’m all over the place musically. I didn’t set out to make techno and don’t plan to stick to it forever, but I’m having way too much fun to stop right now. I do need to sit down and work on creating songs and tracks – I’m not happy about the fact that my live stuff sounds like a bunch of random jams, which they essentially are. My live setup and sounds are a bit hard to pin down, since I’ve just started and am still figuring things out, but here is a general overview from my gig at The Humming Tree – I generally use Ableton Live with a bunch of MIDI loops loaded in. I have no compositions thus far, so it’s essentially one big jam. One track is dedicated to the kick drum. I use three layered kicks: the main kick being the standard Ableton 909 kick. There are two more, one more sine-wave like and one more percussive. They are run through resonant filters for deep bass. I map the individual levels as well as the decay to controllers so I have full control over the kick sound and can mute or fade out different kick levels. The main drums, background pads and samples are also loaded up in Ableton. I chop up percussive clips and load them up as samples, which are then arpeggiated in various Ableton scenes. Again, controller mapping allows me to change the stutter, filter, repeat, and other clever effects that Ableton built in. There are a lot of drone elements too.There’s always a sidechained sub-bass to fortify the low-end – I’m looking for that dark underground techno cellar “pump”, I guess. The hardware part: I send a MIDI out to a Volca Bass, which is controlled by MIDI notes in Live. The audio out from the Volca Bass goes to a (soon to be released!) Godeater bass fuzz goes back into Live and is sidechained and EQd in the box. The Volca Bass sends a tempo sync to a Volca Beats, which goes into a Baron Samedi fuzz. This goes back into Live as well. The Volca Beats does not receive any MIDI information – I use it to add rhythmic textures or additional percussion and make patterns on the fly. I don’t use CC on either instrument so parameters aren’t mapped. Lastly – aux reverb and delay. The reverb is a HUGE part of the Sawhorse sound – I use two separate long and short reverbs and a short tempo-sync delay (around 300 ms). The reverbs have effects on them to keep things moving and interesting and gritty. I like to think of reverb as an instrument in it’s own right. Radiohead and MBV are profoundly well-versed with this. Check out his live set from The Humming Tree Bangalore. Is there any particular reason you choose to use hardware over software and what’s your affiliation towards analog sounds? I actually don’t choose hardware over software – software has a lot of very clear advantages in terms of workflow and programming that are at the very least (to my limited knowledge). I did perform a hardware-only set at Numa, no laptops, no presets and no MIDI. It was incredibly challenging and rewarding; the gratification is immediate and you have to think a lot faster. That being said, it wasn’t very good musically. Your dream piece of gear and why? Oh man. Ask me an easier question. I’m divided between a Teuffel Tesla, a Wal. a Moog Voyager and a 909 –that should cover all instruments. Not being a synth player until very recently, I don’t have a huge overview of synths and have played very few. My picks would probably be the Moog Taurus or Sub37. I quite like the Juno too. At the risk of shamelessly self-promoting myself, the aforementioned AFA modular is keeping me very, very happy at the moment. What kind of music are you inspired by? A few of your favourite artists? I love the blues, particularly Mississippi Delta and Hill Country. Son House, RL Burnside, Elmore James, Mississippi John Hurt… here’s a playlist for you. Industrial and EBM were huge influences – Einstürzende Neubauten, Nitzer Ebb, Skinny Puppy, Coil, NIN, etc. I’m a huge Depeche Mode fan too. Classic rock and prog rock: Rush, Yes, Dream Theater, King Crimson, Zep, Floyd. Some highly underrated guitar geniuses – David Torn aka Splattercell, Michael Brook, Fred Frith. Techno! Rødhåd, Dax J, Monoloc, Perc, Ansome, Ben Klock, Terence Fixmer, Drumcell. I like the newer, darker, heavier Berlin sound, in general. Western Classical – Chopin, Mozart, Rachmaninoff, Liszt. Too much grunge and alternative from the 90s to name. I never really got into metal too far, but Pantera and Metallica were high up on my listening list for a while. Much later, Dream Theater, Fates Warning, Spiral Architect and then Opeth dominated a lot of my listening time. Finally, a shoutout to the electronic scene that is developing on our shores – it’s heartening to see producers find their own way around and come up with a sonic signature that is distinctly their own. I’ve been listening to Hashback Hashish a lot, as well as Kohra, Jitter, _RHL and Oceantied. Could you possibly describe the feeling of putting out a track as opposed to playing a live set for an audience? I really haven’t done enough of either to make a qualified statement, so from the perspective of a novice I’ll say this – putting out tracks for me is more about discipline and practice than trying to blow minds. I’m not saying put out garbage – set certain minimum quality expectations, but making a track a week will probably go a longer way than putting out one track every couple of months. Once it’s out, I try to get critique from producers I look up to, as well as regular listeners. I usually feel a bit nervous once I’ve put it out there, but don’t pay too much attention to it – I’m fine with the fact that I have a long way to go musically and the only way to get there is by creating consistent output and improving along the way. Playing live is a different kind of nervousness – I’m essentially terrified in the beginning. After dispelling the initial fears and becoming aware of the narrative I’m creating, I tend to get into a flow that obscures time. I’m just five gigs down and have yet to reach the point where I’m producing live and can also pay attention to crowd energy and learn how to work that. One thing at a time! Aditya’s enthusiasm and passion both for music, as well as building unique instruments with a personality of their own has driven him to pioneer the Indian electronic instrument/synth/ pedal scene and stamp his very own edgy badge of organised chaos into our set ups.